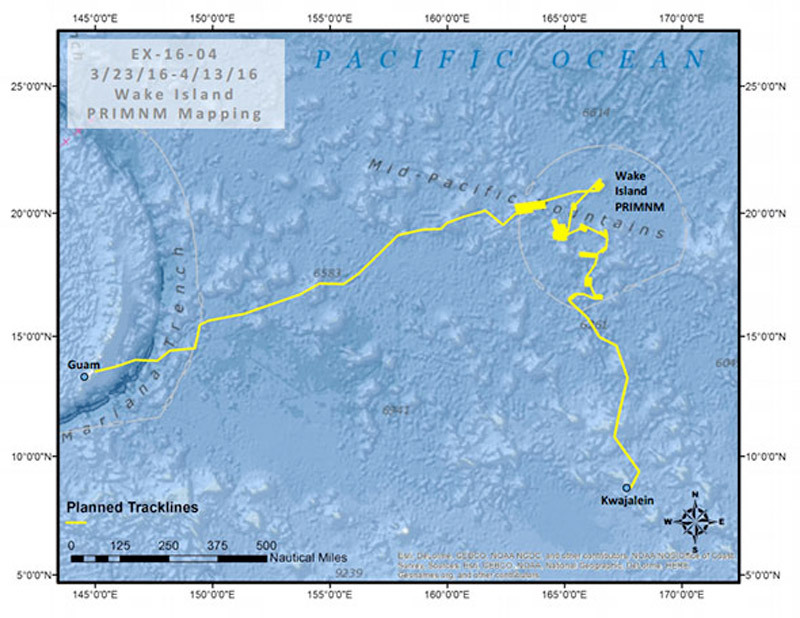 The expected path NOAA Ship Okeanos Explorer will take during the expedition, beginning in Kwajalein Atoll, Marshall Islands, and ending in Guam. Image courtesy of the NOAA Office of Ocean Exploration and Research. Download image (jpg, 129 KB). From March 23 to April 13, 2016, NOAA Ship Okeanos Explorer will conduct 24-hour mapping operations to explore the largely unknown region surrounding the Wake Island Unit of the Pacific Remote Islands Marine National Monument (PRIMNM). This is the first of three cruises in the 2016 field season focused on deepwater exploration of the PRIMNM. Originally created by President George W. Bush in 2009, PRIMNM boundaries were expanded by President Barack Obama on September 29, 2014, to include waters adjacent to Jarvis and Wake Islands and Johnston Atoll. The Wake Island Unit of PRIMNM, the focus of this expedition, encompasses 406,307 square kilometers of ocean area within the U.S. Exclusive Economic Zone. With the boundary expansion, highly pristine areas with unique biodiversity are now protected. This includes numerous seamounts (underwater mountains) that provide habitat for deep-sea corals, sponges, fish, invertebrates, and many other organisms. However, very little high-resolution mapping of this habitat has been done in this region. This expedition therefore represents the most ambitious effort to date to explore this very large U.S. marine protected area. Imagine having the chance to explore and map a U.S. National Monument for the first time! Multibeam sonar, split-beam fisheries sonar, and sub-bottom sonar surveying operations will be conducted continuously throughout the mission, with operations focused on seamounts and potential Underwater Cultural Heritage sites associated with World War II battles in the vicinity of Wake Island. The great majority of these areas have never been mapped using sonar. This mapping work produces high-resolution maps of the seafloor and provides acoustic backscatter data information about the seabed and water column. This information will contribute to our understanding of the geological features and likely distribution of habitats within this vast, recently designated marine protected area. Collected data will be critical in building a baseline for understanding, and therefore better protecting, this unique place and others like it. Expedition data will also form a foundational basis for planning remotely operated vehicle explorations happening later this year. As part of this expedition, a High-frequency Acoustic Recording Package (HARP) buoy will be recovered and a new HARP buoy deployed near Wake Island. The Pacific Islands Fisheries Science Center’s Cetacean Research Program uses this instrument to track marine mammal occurrences in U.S. waters throughout the tropical Pacific. Also, as part of the NOAA Office of Ocean Exploration and Research’s commitment to train the next generation of explorers, the science team for this cruise includes five "Explorer-in-Training" graduate school students that are receiving hands-on skills and field experience. This expedition is part of the multi-year Campaign to Address Pacific monument Science, Technology, and Ocean Needs (CAPSTONE). NOAA priorities for the CAPSTONE campaign include a combination of science, education, outreach, and open data objectives that will support management decisions at multiple levels. The ship will return to port in Guam on April 13, 2016, and our next expedition, which will include live video of seafloor dives, will start on April 20.